1 package of translucent Premo! 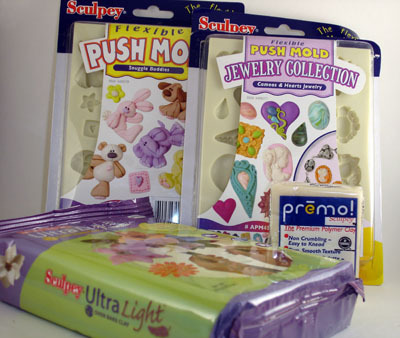 I'm thrilled about the Ultralight Sculpey -- that's been my new favorite product, so more to play with is wonderful. And I can always use another block of translucent clay. I was initially less thrilled about getting the molds. My problem with molds is that so many of them are too recognizable -- a molded character (like the rabbit or teddy bear in the Snuggle Buddies set) is gonna look like someone else's work, unless I tweak it so heavily that I may as well have started from scratch. BUT after looking at the jewelry mold, I think it may be good for doing basics -- things I can build on and make my own. So I'm eager to give it a try. Anyone else do the Polyform test & get a different set of molds? Anyone interested in swapping the Snuggle Buddies set for a different (new OR used) mold...? Update: The Snuggle Buddies mold has been spoken for -- thanks Janice!